The Secretary of the Air Force authorized this award on Aug. 26, 1969. The Air Force Organizational Excellence award recognizes the achievements and accomplishments of U.S. Air Force organizations or activities. 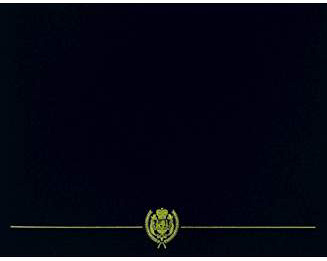 It is awarded to Air Force internal organizations that are entities within larger organizations. They are unique, unnumbered organizations or activities that perform functions normally performed by numbered wings, groups, squadrons, etc. 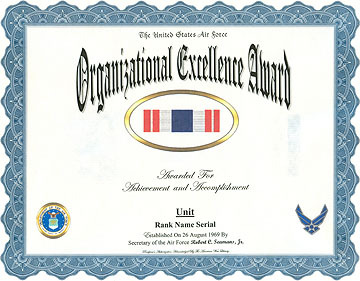 The Organizational Excellence Award was established on August 26, 1969 by Secretary of the Air Force Robert C. Seamans, Jr. The Organizational Excellence Award has been in effect since August 26, 1969. The Organizational Excellence Award is worn after the Out-standing Unit Award and before the Prisoner of War Medal. Additional awards of the Organizational Excellence Award are denoted by oak leaf clusters. An organization that earns this award for combat or direct combat support is entitled to a com-bat "V" device on its streamer, and the individual is entitled to wear the "V" device on the service ribbon.